Jemmco’s Accu-Flo™ Jumbo Dyne Pens are a valve style pen, which release fluid by pushing down on the tip. 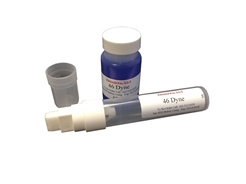 The ¼” wide x ½” long felt tip, regulates the amount of fluid released to the substrate, producing a wide, consistent line, that is easy for the user to read. The refillable barrel holds just under 1.5 ounces of fluid for long, continuous use. These pens are ideal for covering large surface areas. The nice, wide, dark blue stripe is easier to read, making it the perfect pen for identifying treat patterns and back side treatment. 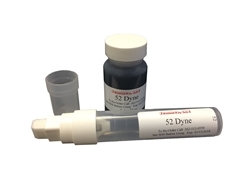 When supplied filled with Jemmco Dyne Solution, the solution is supplied in a separate, hermetically sealed 2 oz container, marked with the Dyne Level and the anticipated expiration date. 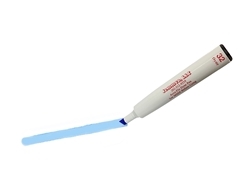 Jemmco Accu-Flo™ Jumbo Dyne Pens are a perfect way to dispense low viscosity liquids. The screw on cap makes it easy to fill, and easy to clean. 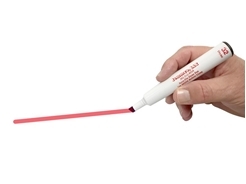 The Jemmco Accu-Flo™ Jumbo Dyne Pen features a replaceable felt tip in order to assure continued accuracy.